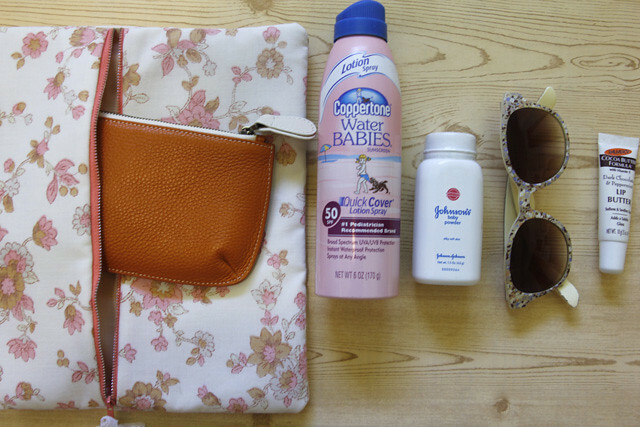 This little pouch holds just the essentials when you’re heading down to the beach. I like taking just a few things so I don’t have to constantly worry about them while I swim. 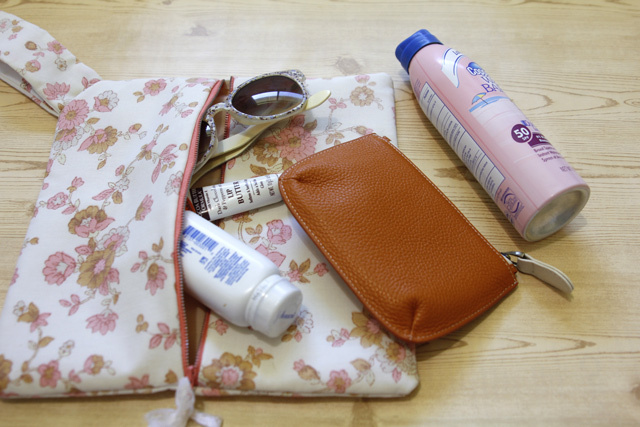 This little pouch was designed just for that purpose of holding a few things, but not everything! I used an old pillowcase for the outside fabric to give it a little vintage charm. Cut your fabrics into 11″ squares. You’ll need two lining layers, two outer layers and four layers of interfacing. I am using Pellon lightweight stabilizer as my interfacing. I decided to use a sew-in because the threads in vintage fabric have a lot of character and I didn’t want to flatten them down with a fusible interfacing. But if you prefer fusible, go for it! We’ll start with the top zippered layer. Stack 1 layer of print fabric with interfacing and cut it in half, right down the middle. Repeat for the lining. 1. Pin print (+interfacing) to front of zipper and lining (+interfacing) to back of zipper, with right sides together. 2. You’ll have a little sandwich that looks like this. 3. Sew along the top edge at 1/4″. 4. Fold your fabric and lining pieces back and you’ll have the first side! Repeat for the second side and you’re front piece will be finished! 1. Cut two strips of fabric and 1 strip of interfacing measuring 2.5″ by 19″. 2. Stack the fabric right sides together and put the interfacing on the bottom. 3. Stitch along both long edges at 1/4″ 4. Turn strap and done! To finish the tote, stack all layers as so: zippered front with front facing up, strap, print fabric face down, interfacing, interfacing, lining fabric face up. Stack them up and pin all together. Trim the edges and clip the corners. Then turn it right side out and you’re done! 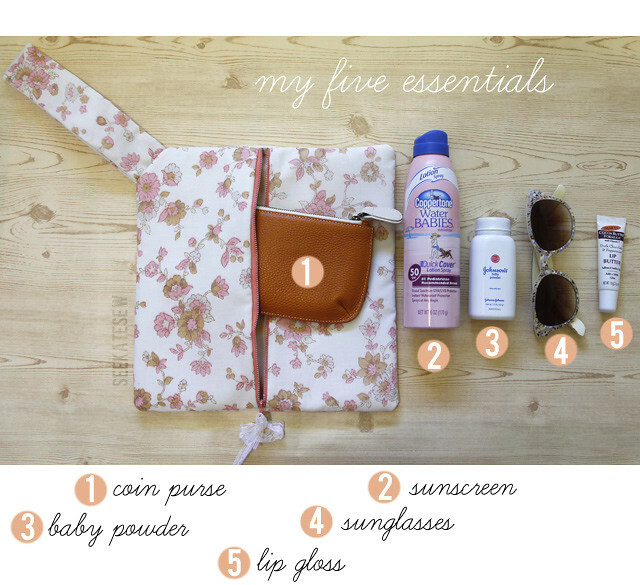 Check out what Liz is sharing today over at Cotton & Curls! So cute, Kate! 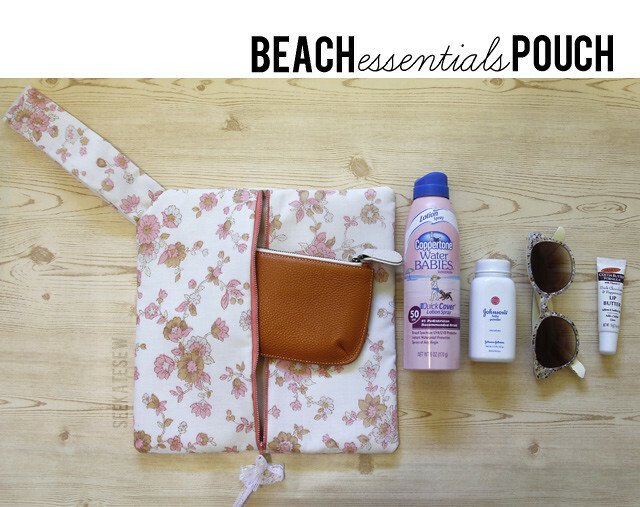 We’re headed to the beach today, so thanks for reminding me to grab the baby powder! I owe ya one! what a cute little bag. I’m a red head and definitely the fairest of them all so bringing along my sunscreen to the beach is essential! LOVE it! where do you get your zippers?? so cute!!! i just love all of the vintage fabrics you use in your projects. Great pouch – thanks so much for the tutorial! Aw cute! If only I had patience.